This glass bottle comes from the ruins of Caesarea Maritima, a Roman city on the Mediterranean coast in what is now northern Israel. Used to hold precious perfumed oils, its long, narrow neck both made it easy to pour out a small drop of oil, and helped prevent evaporation. 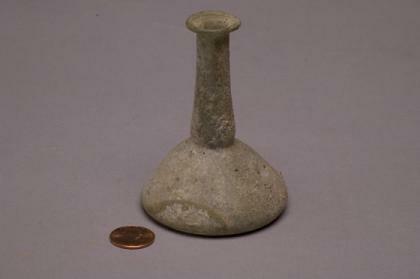 The presence of this bottle, so far from Rome itself, reflects the spread of both the Roman Empire and Roman culture. For the most part, the Romans didn’t simply subjugate conquered peoples. Rather, they tried to assimilate them, bringing the cultures into the political system and turning the people into Roman citizens themselves. This small, mundane bottle shows the success of this approach. There’s lots more to say about the bottle! Try your hand at writing your own label on the computer to the left.